I had been spoilt for space (and peace) in Montgenevre and it was cheap, at the time when I needed to put any spare cash into developing the Izoard RR concept. And the riding was obviously out of this world. I’ve never been more active, ridden more often or felt stronger. Practicalities are just that though. Fast forward to running low on money (I was a year behind plan at the end of the Winter in 2017, I’d missed Bespoked and still had no product, albeit nearly ready) and I started to realise that turning a quick buck from an essential side hustle was really tough at the top of a deserted mountain. After our London launch in June 2017 and all the opportunity that came with that, it quickly became apparent that I needed to be in both places, somehow. Mum had had a bad turn too and wasn’t well so the time was right to head home to the UK for a bit and split my time between there and the Alps. I started looking for a place that would serve as a UK workshop. Out of London and it’s high rent and expensive distractions, right in the middle of Brighton we found a little live-work unit on Orange Row. It was small, but was a shop front of sorts just off the main drag. I wouldn’t have endless visitors all day, but it was right in the middle of it all if people wanted to find me. There was modest but manageable space for tools a work-stand and the chance to keep my tools busy servicing local riders bikes. It was the right spot for now, and I could live there too. If the space was good, the landlord needed to be amazing. I was on my bootstraps. The landlord was like the guy you need when you need it. For some reason he didn’t mind that I had no accounts, and largely no business. He liked what we had to say and gave us a go. Not one reference. I got the branding done fast. I called it Orange Row Speed Shop. We printed leaflets and went a bit old school on the marketing, hanging little cards on people’s bicycles all over town. And in-between, I waited. Painfully waited. I’d opened a bike shop in the middle of Winter, with no cash. One by one however, bikes and their owners started to turn up. Mostly winter commuters with filthy but interesting enough bikes. General servicing, changing chains, tyres, brake pads. Some stuff I hadn’t touched for years. As you’d expect. Then the same customers came back with their ‘other’ bikes and eventually, now, I’ve got a good little bunch of loyal riders, who always come to me. One guy has even bought a Spoon Customs frame. Running a bike shop full time is not a walk in the park and it’s distracted me from the custom bike business on the odd occasion. 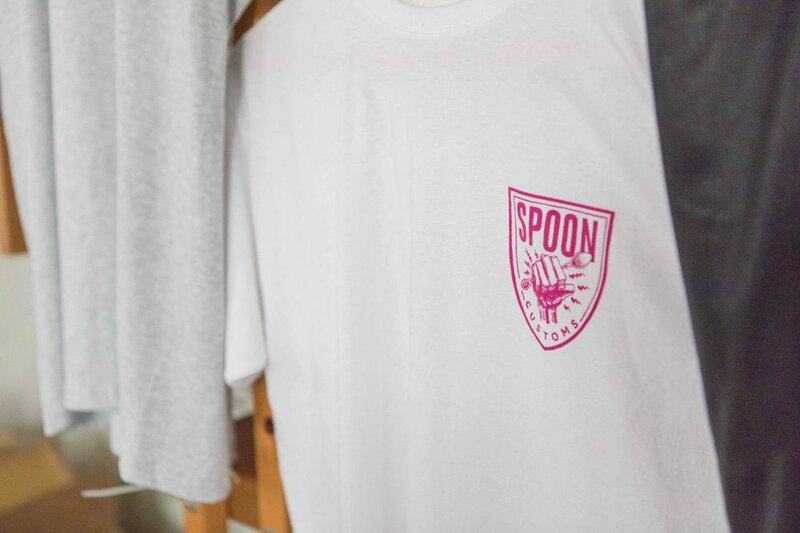 Unsurprisingly the best month in the shop was the worst for Spoon Customs. But even though at times it’s been a distraction, it’s also allowed the custom business to grow at the steady rate it needs to - not forcing me into bad decisions about materials, fabrication or finish. For example, I turned down a commission to make a bicycle powered food blender, because I could. I’d like to think I always would have (I mean WTF) but the workshop income meant I could say no, and that’s been invaluable. A year on with Spoon Customs getting busier, I’m now able to put the bolt croppers and WD40 down a bit more and shift the balance back to full time design and development for Spoon Customs. Last month for the first time I didn’t fix any bicycles - the workshop was instead buzzing with deliveries of Campag gear, Zipps and carbon parts for my own Spoon Customs builds, all of them heading out the door to proper customers. So, I’ve made a few changes. Ive taken the decision to close the workshop door during the day (but it’s still open if you call or message). Even with a puncture repair. But with the door shut and less servicing slots available (equivalent to two days a week now spread over the week to suit the customer) I’m able to focus on the type of bikes I can really get my teeth into, from the sort of customers who love road bikes as much as I do and want them right, and that feels good. 20% workshop, 80% Spoon Customs. It’s another leap of faith, but SC feels like it can take the load now, and that’s a really special realisation. There’s another realisation about running a bike shop. It’s lovely to be surrounded by bikes, but it’s bloody tough to actually ride them. And, shop life is a pizza slice for lunch on a healthy day. As a result, I’ve let the fitness slip and refocussing the business again will give me more time to do the stuff that matters the very most - riding my bikes again. I was riding every day in the Alps, all summer, for three summer seasons. That above all else is the reason why the first concept was received so well. We’d put the miles into it, either in terms of understanding what it had to be, or making sure it was fabricated right, or making sure the bike and components rode right, cos I’d ridden them to death. 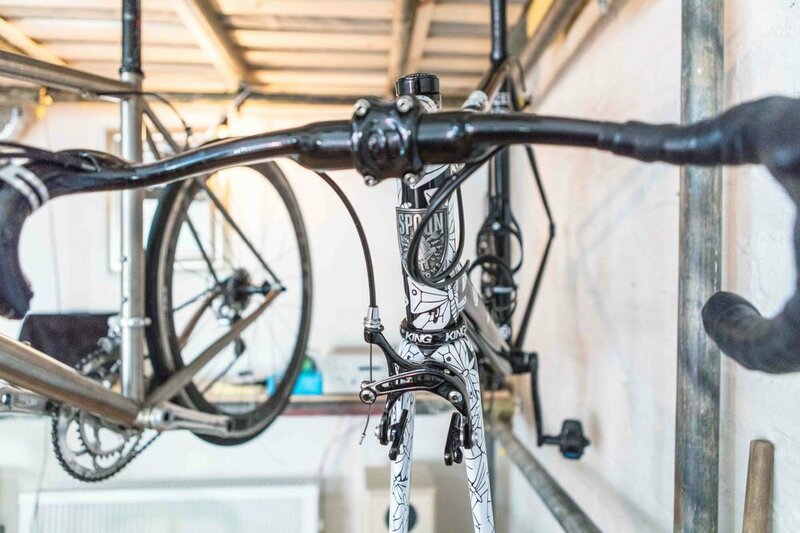 Location (I live in an alley way full of bins and graffiti now) and chasing cash flow (those parts and paint don’t pay for themselves) every month has made riding trickier, and given me a raft of excuses not to, but that’s stopping. Riding is core business again. 1. The fun stuff; Source skatepark in Hastings one night a week is now part of director’s responsibility, for shits and giggles. 2. There’s a compulsory Olympic Triathlon in the Summer to give me something to aim at. Thanks to all my Orange Row Speed Shop and Spoon Customs customers for the first year in the new shop, and massive Thanks to Paul (our landlord) for taking a flyer on me at the right time and to Sara for all her hard work and help. If you’re struggling to get training in too or need to switch things up a bit in favour of the bicycle, we’re booking up early season Alps training camps now so get in touch and I can put an itinerary together for you, or I can hook you up with someone local. We’ve also got all the parts from all the big brands (Enve, Campagnolo, Silca, Parcours, Vittoria, 3T, Deda) and we can often match or beat Wiggle prices, and we ship most in stock items next day or three days maximum. I even put Haribo in the bloody box before it ships, so no excuse to not use me and there’s no better motivator than shiny new parts… ahem.